As you can probably tell by the photographs for this week’s feature I ate much later than normal, 5.00pm to be exact, but it doesn’t really matter as Pieminister doesn’t have a special midday menu, so this is what you would also have at lunchtime. Another deviation from the normal review was that I didn’t eat alone. My colleague Charles Eager joined me for the event as we were both going to Leeds Playhouse to do a joint review of their production of Hamlet. That explains the hour as well. As luck would have it it was National Pie Week and there was a 2-4-1 offer running so it was win/win. Sadly, it didn’t apply to the beer. Regular readers will agree that I have been known to throw in the occasional pun, but the menu here is packed with them so don’t say you haven’t been warned. The first evidence of this was the March Limited Edition Lady Baa Baa lamb pie. It just came in the normal crust rather than being presented in strips of meat as Ms Germanotta famously once did. The idea is that there is a selection of pies which are available in various forms. You can have them straight for £5.95 or add sides. The Pie Meal Deals add extras for an inclusive price. Charles and I opted for Mothership – when I say we opted for it I mean that he texted me saying that he had been held up so asked me to order for him – so it was my opt! He wanted poultry so he was given the Funghi Chicken as sounded like a goodie, and I went for Kate and Sidney. The former was described as ‘Free Range British Chicken, Portobello and Chestnut Mushroom Pie’, mine, as you might expect, was ‘British Beef Steak, Kidney and Craft Ale Pie’. 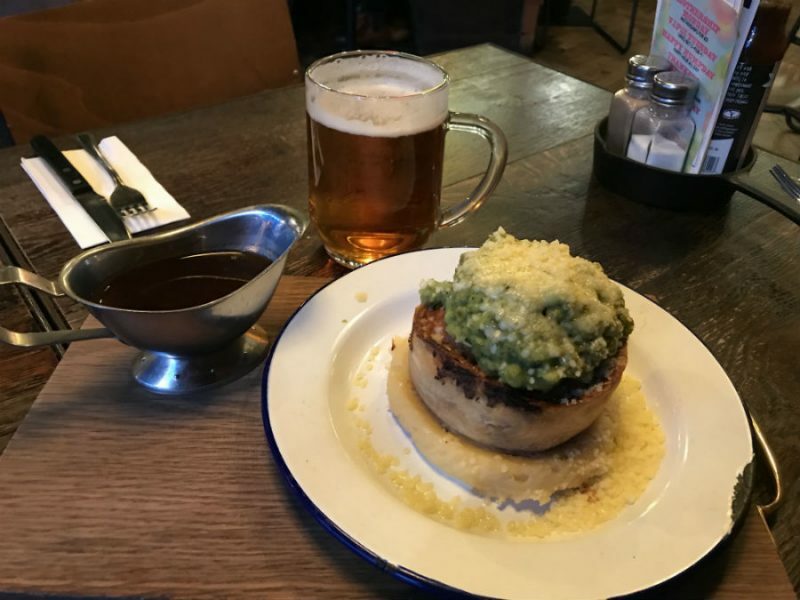 By choosing the ‘Mothership’ meal we were served our pies with ‘Mash, Minty Mushy Peas, Cheddar and Crispy Shallots’. Both came with a gravy boat filled with the appropriately flavoured lubrication. The presentation was very appealing, with the pie sitting atop the mash with the peas, cheese and shallot topping the whole thing off. More cheddar was sprinkled around the plate to add a further cheffy touch. The price was £9.95. As everyone knows, it is highly illegal for a chap to have a pie without a pint so, in order to save us a night in the Bridewell, I added a Freedom Ale each at £4.85. The beer was described as a Pie.P.A. (I did warn you) and was a refreshing craft ale, perfect with the comfort food on offer. Both the pies were made from shortcrust pastry, which I much prefer over puff pastry but still comes second to the hot water pastry pork pie style. I did find the bottom to be a bit hard to cut and chew but at least it meant that it was a ‘proper’ pie rather than a ramekin of stew with a crust plonked on top. Both of the offerings were adequately stuffed with filling. Charles said that he was more than happy with his and I felt much the same about mine. The meat was tender and well cooked, and my only criticism would be that the pieces of kidney were chopped very finely. I still had the flavour but missed the texture. 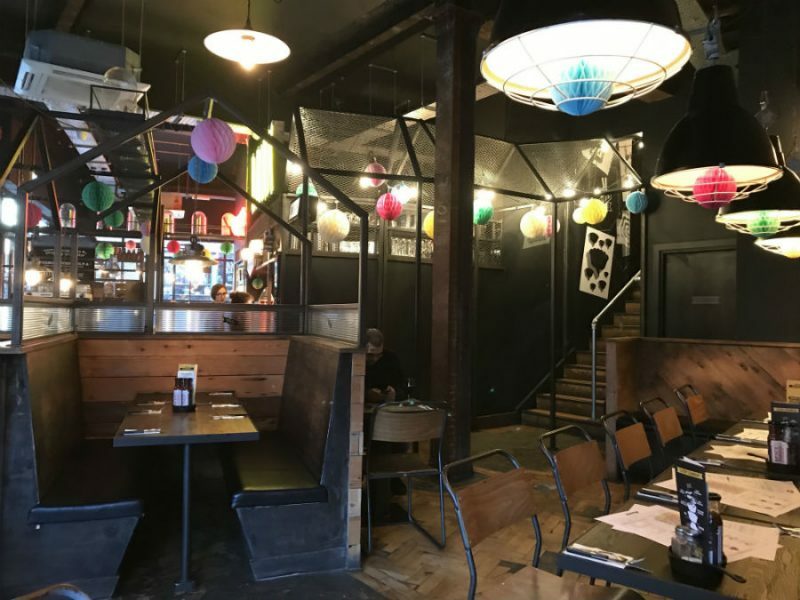 The service was excellent and the food came in good time. All in all, a good lunch stop. If you fancy trying out the goods without going to the restaurant, they are on sale in Waitrose supermarkets. I think that I have yielded the stage as far as puns are concerned for long enough, so here goes. You May want to keep your eyes Peel(ed) for one of Pieminister’s many special offers or why not have a family pie eating contest and Pitt the Younger members against the Elder. If you decide to eat alfresco you could take them on a picnic to your own corner of Eden on the Heath or up Church Hill but don’t forget the Brown sauce. Sorry, I must go now as I just can’t Blair it any more.